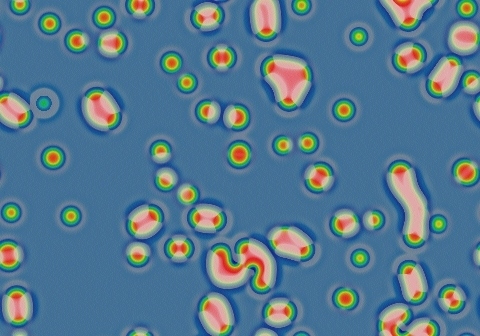 These images and movie demonstrate the behavior of the Gray-Scott reaction-diffusion system with σ=Du/Dv=2 and parameters F=0.1020, k=0.0550. On a red background, blue spots form solitons or worms that grow to fill the space. On a blue background (as seen here), red spots below a critical size shrink and vanish, while spots above that minimum size grow into a network of lines with the occasional worm. Cells coalesce like soap bubbles and the pattern evolves towards a network of hexagons, except for the occasional defect caused by a cell containing a worm. As seen here (1:05-1:32) cells containing worms can get squeezed out. Sometimes a few negatons can survive longer by clumping (compare top-right at 1:15-1:28 to bottom-center at 1:40-2:10). This pattern evolves for about another 5,000,000 tu.